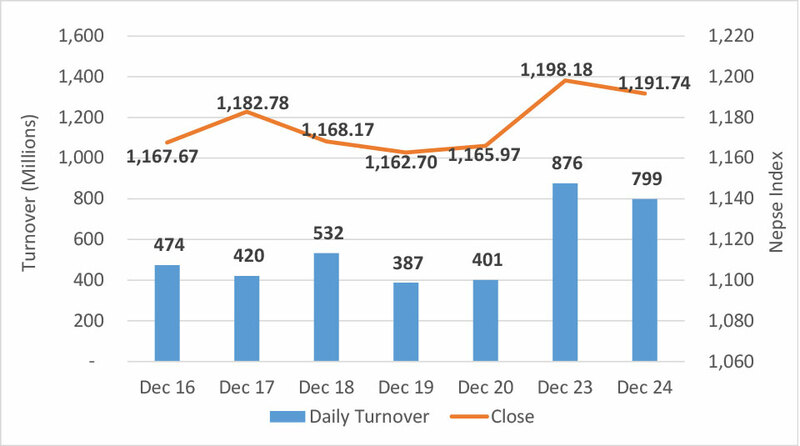 KATHMANDU, Dec 25: Strength carried over from the preceding session as the Nepal Stock Exchange (Nepse) index rallied more than 9 points in Monday's morning trading. Consequently, the benchmark index traded above 1,200 points mark for most of the beginning trading hour. Nonetheless, the index pared its initial gains and fluctuated throughout the latter trading hours to eventually close the day in red. Nepse posted a loss of 6.45 points to end at 1,191.74 points. The equity index, which surged more than 32 points on Sunday, witnessed a slight correction on Monday. As a result, the index failed to close above the crucial 1,200 points mark. The losses on the day came on the back of profit booking by traders in the secondary market. The market witnessed active participation for a second consecutive day as more than Rs 798 million worth of shares were exchanged in the session. Sectoral indices turned in mixed performance. Biggest gains on the day came from Life Insurance stocks as reflected by a 1.21 percent rise in the group's sub-index. Finance stocks also posted significant move to the upside. The segment's sub-index added 0.83 percent. Similarly, sub-indices of 'Others' and Manufacturing & Processing sub-groups also closed higher. On the losing front, Trading stocks came under pressure as the respective sub-index tanked 4.8 percent. Hotels and Development Bank sub-indices followed suit with a decline of more than 1 percent. Similarly, Heavyweight banking sub-index shed 0.98 percent on the day. Microfinance and Non-Life Insurance sub-indices also closed marginally lower. NMB Bank Ltd led the list of active scrips on the day as the bank is closing its shareholders' book on Tuesday for the purpose of carrying out its Annual General Meeting (AGM) which is due to approve its dividend. The bank has declared 20 percent cash dividend and 10 percent bonus shares to its shareholders. Next, more than Rs 82 million worth of Prime Commercial Bank Ltd Promoter Shares also changed hands. Further, Nepal Investment Bank Ltd and Life Insurance Corporation of Nepal registered total transactions of over Rs 32 million each. Among advances, shares of Hathway Finance Company Ltd and Global IME Laghubitta Bittiya Sanstha Ltd rallied to hit the upper circuit of 10 percent. Correspondingly, Civil Laghubitta Bittiya Sanstha Ltd also jumped 9.95 percent. Jalabidyut Lagani Tatha Bikas Co. Ltd's scrips posted a gain of 9.87 percent after the company declared its Annual General Meeting on January 14 with distribution of 10 percent stock dividend and issuance of 100 percent right agenda as its key agendas. Conversely, shares of Bishal Bazar Company Ltd and Multipurpose Finance Company Ltd struggled and slumped over 7 percent apiece. Garima Bikas Bank Ltd also tumbled over 6 percent after the bank's Chief Executive Officer (CEO) denied the rumors of its possible merger with NMB Bank Ltd. Further, Shangrila Development Bank Ltd, Arun Kabeli Power Ltd and Oriental Hotels Ltd posted losses of over 4 percent each. ARKS technical analysis indicates the market forming a bearish candlestick as the index pared some of its previous day gains. However, technical indicators suggest that the market still remains in favor of the bulls. Hence, a breach of 1,200 points in subsequent sessions with substantial turnover might see the index rise further to 1,220 to 1,240 points. On the other hand, the failure to cross the aforementioned mark might indicate further short term downtrend.